Coral atolls are found throughout Sulawesi. Scientists believe that atolls are formed when sinking volcanoes leave coral ring reefs behind. After a volcanic cone rises from the sea, a coral reef forms around it. Eventually the volcano cone sinks. Only the coral ring is left. 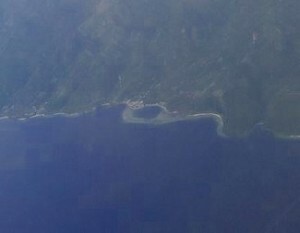 This is called an atoll. Called Biluhu Ring by local divers into atoll diving, this atoll is located right off the beach. That is why Miguel’s Diving calls it Coastal Atoll. Waters inside rarely circulate. The jellyfish that live inside have fully functional stings! The ring itself is usually too shallow for diving or even snorkeling. Since the atoll faces into the heavy waves, its upper surface very rocky. Along several slopes, rubble has collected. It is a result of storms. A number of small coral arms reach down the steep walls of the outer atoll. Miguel’s Diving has not measured the length of this dive site. Conditions: Typical visibility is 18 meters. Ocean conditions here can be tricky. This includes tidal movement, long shore currents and waves pushed by winds. Divers should let Miguel’s Diving staff decide whether the ocean conditions favor a safe dive at this site or not. Back roll into the surface current and proceed down the outer wall of the atoll. Notice a basin that is full of hard corals and Cigar sponges (Haliclona vanderlandi 2001). This sponge is one of Gorontalo’s new species. Its ash-colored rims and long maroon pipes are quite distinctive. 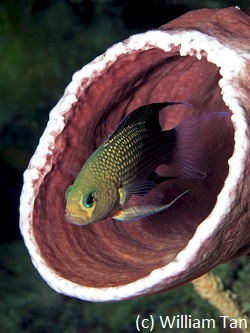 A Longfin dottyback (Pseudochromis polynemus) cautiously peers from one cigar. Easily over-looked, this fish is rarely seen in other dive destinations. It is quite common in most of Gorontalo’s coral dive sites. In a hole at the base of a wall, a Blue-spotted mask ray stays motionless, hoping you will not see it. Your dive guide signals to something in the coral rubble. It is a large Cuttlefish. As you approach, it begins changing colors, putting on quite a show. As it turns to yellow with brown bands, it closes its tentacles and shoots backwards and away. At the crest of an arm of coral that descends from the reef flat, schools of fusiliers and butterflyfishes gather. Another blue-spotted ray swims away quickly. It is startled because divers are still uncommon in Gorontalo. Marine life here is not trained to interact with humans and still exhibits natural behaviors. Now that time has come for a safety stop, enjoy watching a tiny Flabillina aeolid nudibranch that the dive guide has found.